The comprehensive range of Dosa Mix Flavour offered by us is quite popular across the southern Indians. It is formulated using rice, Urad dal, & fenugreek and is widely consumed for its low fat content. We undertake hygienic processing of our range of mix and offer it in moisture & tamper proof packaging. Multigrain millet idli & dosa mixes. Banking on the skills of our qualified team of professionals, we are instrumental in offering supreme quality range of Dosa Powder. As per the needs and requirements of our clients, we are involved in providing Varaku Dosa Mix. Dosa, the traditional favorite of the south, has now become a versatile dish that dots tables around the world. Millet are very nutritious and considered to be one of the most digestible and non-allergenic grains available today. Millets are nonacid forming foods, thus making them soothing and easily digestible. Prepared from the finest quality rice, our Idli Dosa mix can be utilized to prepare soft and fluffy idlies and crisp dosas. Our mix is prepared under stringent quality conditions and special care is given to the packaging of the mix. This ensures that the mix remains fresh, till the time the packet is opened for consumption. Our company has mastered the art for providing Ragi Dosa Mix to the clients. This product is properly packed using premium packaging material to make sure safety during transit. Ragi Dosa Mix is prepared under clean environment using finest quality material and with the help of sophisticated technology. 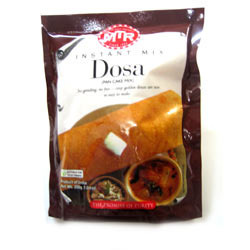 For the diverse requirements of our clients we are offering a wide array of Dosa Mix. These products are well processed by our vendors using advanced techniques to render maximum client satisfaction. 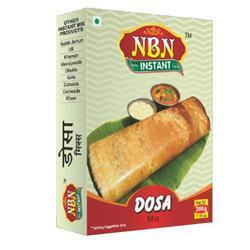 Offered products are made using dosa and are highly reckoned among our clients due to their excellent quality purity.